Balticon's main charity is BSFS Books for Kids, a longstanding focus of the Baltimore Science Fiction Society (BSFS) on buying books for area kids who could not otherwise afford them. The Liars' Panel, an event I've run many times, raises money for this charity by making people pay a buck each to challenge a panelist when they think that person is lying. If the panelist is telling the truth, all those dollar bills go into bowls that runners use to collect the cash. If the panelist is lying, the panelist pays ten dollars into a bucket. Today, I had the privilege of participating in and moderating a Liars' Panel with Joe Haldeman, Mur Lafferty, George R.R. Martin, and Jody Lynn Nye. Over the course of 85 minutes we answered questions I had previously distributed to the panelists and told both lies and outrageous truths. 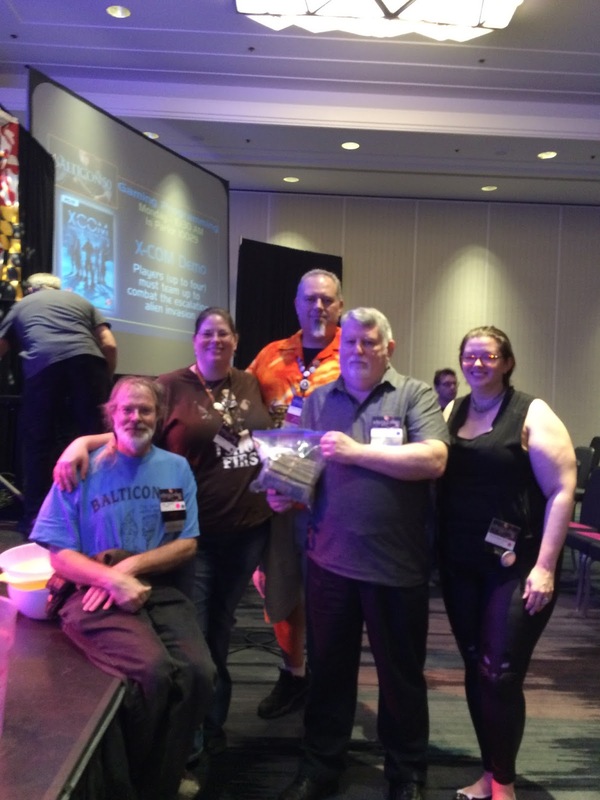 I'm happy to report that this panel set a Balticon record by raising $850 for the charity. Everyone laughed a lot, we all had a good time, and we did a little good. Not a bad outcome for a con panel. Later, I introduced George R.R. Martin's reading, at which he entertained a very large audience full of fans of his series. The reading was quite entertaining, if dark, and the audience loved both it and the brief Q&A session afterward. My last con activity of the day was a large group dinner with the returning and current guests of honor and many con staffers. Everyone at Balticon treated me very well, and it was a great pleasure and honor to act as the Toastmaster for the con.